A combination of smoke and clouds hovered over Los Angeles County on the afternoon of September 2, 2009, as remnants of the Station Fire continued to burn. The Moderate Resolution Imaging Spectroradiometer (MODIS) on NASA’s Aqua satellite captured this true-color image around 1:55 p.m. local time (20:55 UTC) on September 2, 2009. The wildfire threat to historic Mount Wilson Observatoryseems to have subsided, though firefighters are still wary of the blaze, whichhas burned more than 144,000 acres. The so-called Station fire has been burning through Angeles National Forest for more than a week now. 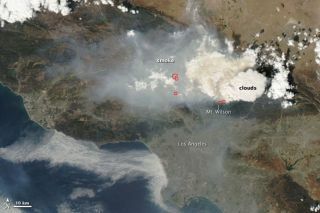 The fire began to creep up the slopes of Mount Wilson, toward the observatory and communications towers at its peak, over theweekend, after retreating from the nearby NASA Jet PropulsionLaboratory. The 100-year-oldobservatory was founded in 1904 by George Ellery Hale, who used solartelescope observations made there to prove that sunspots were areas of lowertemperature on the sun's surface. Edwin Hubble also used observations made at Mount Wilson to show that the Milky Way is only one of many galaxies and that the universeis expanding. The history of the observatory, and the modern astronomyprojects still carried out there, were under threat for several days as theflames of the rapidly intensifying wildfire crept closer to the outpost'sstructures. To keep the fire from reaching the peak, firefightersdug fire lines, cleared brush and dumped fire retardant chemicals from the airin the woods surrounding the observatory. On Monday and Tuesday, the outlook was grim, but by Wednesdaycooler temperatures and higher humidity had forced the flames back. The threatstill isn't gone, but firefighters sound more optimistic than in days past. "We're pretty confident," Los Angeles County FireInspector Edward Osorio told the L.A. Times. "Mt. Wilson is going to beOK." Observatory officials are staying cautious though. Thelatest update to the observatory website, made Wednesday afternoon, read,"The fire to the north, against which all the back fires and preparationof last night were mounted, still lurks. I remain optimistic, but we cannotdeclare the end to any danger until the fire is declared contained byauthorities." Fire containment, which sits at 38 percent now according tonews reports, is not expected to be fully achieved until Sept. 15.